Being a homeowner takes a lot of dedication and hard work. There are two approaches that people tend to take when it comes to taking care of a house. The first group is the proactive group: they make sure that they are evaluating all of the different systems in their home on an annual basis. They check for malfunctions and small problems both inside and outside of their home. They either hire a roofer to come out and repair any roof problems, or they climb up there and do the repairs themselves. They have a gutter guy: the guy that comes out to their home once or twice a year and cleans out the gutters for them, and they know exactly what kind of insulation is in their home and what the R value is on that insulation (how well it keeps heat in or reflects heat out of the home.) Then there is the second group (the larger group) that keeps up with their home repairs, but only when they discover an issue. When it comes to the roofing on their home, they often do not think about repairing or replacing it until they discover a leak in their home, or they are ready to put it on the market for sale and realize that their roof is 20 years old and will never sell unless they replace it. It can be easy to forget about your roof until you see a problem arise, but what many people do not realize is that once a leak has become large enough for you to notice it from inside your house, you likely have a much bigger problem on your hands than simply repairing or replacing a few roof shingles. That water has had to work very hard to make its way past the shingles and the underlay, through the attic and the insulation and down into your drywall. Once it is in the drywall then it has to sit there for days or weeks, slowly eating away at the drywall until it finally creates a noticeable bulge or watermark. By then you have the buildup of water in the wall that will now have to be replaced and repainted, and that is after it is hacked into and treated for the mold and fungus that it has likely started to grow in the damp and dark environment. Or as homeowner you could avoid all of the cost and work of fixing a leak by being proactive and catching issuing on your roofing before they start. Conducting a quick inspection of your roof twice a year can help alleviate much of the money that you would have to spend on major roof repairs. 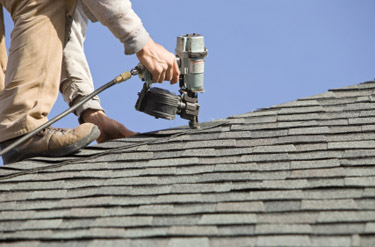 To complete an easy roof inspection, all you really need is a flashlight and a good sturdy ladder. Take your flashlight into the attic and look for signs of dampness and water, or places where the light from outside is shining through into the attic. These are problem areas that need to be addressed. By doing this you can catch water issues before they start. ← How to find a quality company offering private money lending.